During this long period of delay and potential litigation, ugly passions would again be aroused. And our people would again be polarized in their opinions. And the credibility of our free institutions of government would again be challenged at home and abroad…. My conscience tells me clearly and certainly that I cannot prolong the bad dreams that continue to reopen a chapter that is closed. My conscience tells me that only I, as President, have the Constitutional power to firmly shut and seal this book. My conscience tells me that it is my duty, not merely to proclaim domestic tranquility, but to use every means I have to ensure it. What could all this be about? What does Hunt know about some still-secret “thing” associating Nixon in some new, dreadful way with the invasion of Cuba of April 1961? Was the Bay of Pigs Fiasco not Kennedy’s fiasco? By the time of the invasion, Nixon had already been out of office for three months. What did Nixon have to do with it? And whom exactly does Haldeman protect with this haunting phrase, “except by contracts and connection”? True, as vice president, Nixon had been chief political officer on the National Security Council’s Special Group (5412/2) in which the Cuban invasion was conceived, decided upon, planned and directed. He has written of flying from California to Washington on the day of the invasion and that evening receiving CIA Director Allen Dulles, who brought the news that all was lost. But there was nothing secret about any of this. What could Hunt now add to the story of the Bay of Pigs that would put Nixon in such steep new peril? So far in the national analysis of Watergate, this question has been largely overlooked. What was fastened upon in the June 23 tapes was rather the brief passage in which, unmistakably, Nixon tells Haldeman to cover up White House complicity in the Watergate cover up. That bit of evidence convicted Nixon in the public mind of an impeachable offense and the remaining salvos were left unfired. So what could “the whole Bay of Pigs thing” be? The book of standard American impressions badly overstates the respect in which the Bay of Pigs Fiasco was a Cold War confrontation between the Free World and communism and understates the respect in which it was also a confrontation between rival American power elites, each with its strengths and weaknesses, Kennedy on one side and Nixon on the other and as I would say, Yankee and Cowboy in makeup. That is why the operation turned out the “Fiasco” which all parties promptly agreed to call it. To unravel this, start with the conventional picture of the Bay of Pigs as a Cold War confrontation. In the 1960 campaign, Kennedy promised to get tough with Castro, trying to get to the right of Nixon on the Cuban issue at the very moment that Nixon was secretly operating as the chief political officer in the invasion planning group. Within scant months of taking office, Kennedy seemed to keep his promise; within hours more, he had failed to make it good. As a result of the Fiasco ending, the Russians got more deeply involved in Cuban affairs and brought Kennedy to the test of wills over the October Missile Crisis a year and a half later, in which Kennedy is supposed to have stood his ground and regained his manhood. To this general picture, the activists of the anti-Castro invasion, such as Nixon and Hunt, add a critical detail, namely, that the fault for the failure of the Cuban invasion lies with Kennedy. Kennedy, they, cut back on critical U.S. support to the invasion forces at the last moment and thereby doomed to failure a project they believe could otherwise have succeeded easily. This theory suffers from the crude partisanship which keeps it from looking beyond such notions as cowardice and treachery to explain Kennedy’s apparent about-face at the beach. But it does recognize that the Kennedy administration was in sharp internal conflict over what to do about Cuba, and that the formulation and implementation of Frontier Camelot Cuban policy were affected by this conflict, or as might be said, disfigured by it. That is the key point which the Cold War conception of the Bay of Pigs Fiasco cannot bring into focus: that the Cuban question and the question of hemispheric revolution so divided the Kennedy administration that the United States could neither accept Castro nor act with a will to destroy what Castro stood for. The cause of Nixon’s panic a decade thereafter about what his comrade Hunt know of “the whole Bay of Pigs thing” may thus lie within the terms of this conflict, which we now explore. But, as had happened in the Eisenhower administration, a sharp difference of opinion about Castro developed among President Kennedy’s advisors. One group of activists urged him to go forward with the invasion plan. His liberal advisors…advised that the United States should either try to get along with Castro or find some other method of dealing with him….Kennedy finally over-ruled his soft-line advisors and decided to go forward with the plan….But in the end the soft-liners won their point and, by last-minute compromises, doomed the invasion to failure. Thus, in the eyes of the invasion’s self-styled “strongest advocate,” Kennedy did not go forward with the agreed-to plans, he went forward with a new and different set of plans, plans that no one had actually proposed or defended or thought would work, plans (a) minus the use of the B-26s ready and waiting in Central America and (b) minus a CIA subplot to assassinate Castro. What was the actual significance of these two last-minute changes? For an insight into this, we first have to sketch out the CIA’s most probable invasion scenario. From the sophistication, if not the overwhelming competence, it has shown in other such operations, the CIA should not be thought vain enough to think its Free Cuba exile army could actually endure against the arms of the Cuban revolution, much less march to the capital. The CIA strategy was more roundabout: “to maintain an invasion force on Cuban territory for at least 72 hours and then to proclaim the Free Government of Cuba there on that bit of territory.” From threw they would unveil a world-wide network of Free Cuba exile government offices, already assembled, in an effort to pull the U.S. military into demonstration-state alert and exert U.S. diplomatic influence with the OAS, the UN, the Soviet Union, and other countries to move “the Cuban situation” to an international-negotiations setting. They would thust hrow open again the whole political question of Cuba’s internal direction, with many opportunities for counterrevolutionary maneuver. The fate of such a strategy would hinge on the missions of the B-26s and the assassination squad. The B-26s were important because in order for the invading forces to hold a position on the beach without direct U.S. aerial support, it was necessary for Castro’s air force to be suppressed. This amounted only to two trainer jets left behind by Batista on which Cuban mechanics had mounted rudimentary armament systems. But if the invaders were to have a chance at their basic positional objectives, these two little jets would have to be kept out of the air. Crude as they were, unopposed against ground forces on a beach, they could be decisive in the battle. Had the B-26s flown in from the Atlantic out of the sunrise, as first planned, and caught the Cuban jets on the ground, the landing forces would have encountered no Cuban air resistance. That might have made it possible to hold the beachhead a little longer. From a technical standpoint, the assassination of Castro was equally important to the success of the invasion. The revolutionary government was at that time a little more than two years old. It still consisted in some part of antagonistic groupings held together mainly by Castro’s great prestige. Wouldn’t the elimination of the Castro brothers encourage fragmentation? Look at the CIA’s broad daylight murder of Allende in 1973 for the component of the Bay of Pigs invasion plan that Kennedy vetoed in 1961: the assassination of the leader. The particular importance of the Castro hit to the overall success of the invasion may be inferred from the intensity of the struggle about it. Journalist Cuba-watcher Ted Szulc reported thirteen years later that in a private Oval Office interview with Kennedy in November 1961, with Richard Goodwin present, seven months after the invasion had been repulsed and/or betrayed, Kennedy said to him, “What would you think if I ordered Castro to be assassinated?” Szulc says he objected to this idea and that Kennedy “leaned back in the chair, smiled, and said that he had been testing me because he was under great pressure from his advisors in the intelligence community (whom he did not name) to have Castro killed, but that he himself violently opposed it on the grounds that for moral reasons, the United States should never be party to political assassinations. Another anecdote has Florida’s Senator Smathers pressing Kennedy for Castro’s head at a formal White House dinner. Kennedy is finally infuriated and breaks plates and scatters flowers to convince Smathers he must stop asking. The intensity of feeling no doubt flowed both ways. Early in 1975 an item long familiar to conspiracy researchers became big-time news: It was that around the time of the Bay of Pigs the CIA used Howard Hughes’s special agent Robert Maheu to contract the services of Syndicate Capo John Roselli to get rid of Castro. The immediate question posted by this now authenticated story is whether it was Kennedy to actually authorized the CIA to use a Syndicate hitman to liquidate Castro, or somebody else. Why should the CIA have to rent assassination capabilities from the Syndicate? The timing of these events is uncertain. We do not know at what moment Kennedy vetoed the Castro assassination plot or at what moment the CIA used its Hughes-Maheu connection to retain a Syndicate assassination squad. It appears that Kennedy first told the CIA not to carry out the assassination, and that the “activist” elements of “the intelligence community” then took it upon themselves to mobilize Syndicate resources to the task. That is the whole point. From the standpoint of the Nixon side, the Kennedy side wanted the Cuban invasion to fail. There is no other explanation for the quickness and venom with which the pro invasion side fastened on Kennedy’s “betrayal” of their project. Nixon tells us the conflict about Castro began in the State Department before Kennedy came on. Obviously it sharpened with his arrival. We know Kennedy was furious in the Bay of Pigs aftermath and he felt betrayed – betrayed by the CIA and the larger clandestine state in fact – and that he tried to reorganize the overall clandestine apparatus, and especially the CIA, precisely to make it responsive and accountable to the White House. Yet the left denounces Kennedy for invading Cuba as casually as the right denounces him for invading it too timidly. One side sees Kennedy’s “betrayal” and the other sees his “failure to understand the situation.” The idea that the actual policy as carried out was the free synthesis of a totally absorbing internal conflict over which neither side had complete control does not seem to be widely entertained. Rather more astounding looking back post-Watergate is the insensitivity of liberal commentary to the importance of the internal conflict that wracked Frontier Camelot from the first. It is general knowledge that Kennedy was at odds with powerful hawks from the outset of his administration on the question not only of Cuba but of Laos, Vietnam, and the Congo, on the questions of the Third World as a whole, disarmament, Berlin, nuclear weapons, etc., that he came to mistrust the whole security-intelligence apparatus, and that he finally should to reduce the influence of Johnson and his circles. Halberstam’s book is actually a treasure chest of examples of that mistrust and shows clearly the Yankee/Cowboy outlines of the Kennedy Administration. Why then do Halberstam and other liberals now weigh this division in with the other forces acting on policy? We see Kennedy’s Cuban policy better if we simply recognize that it was formed under conditions of internal conflict, within the executive policy apparatus itself. Frontier Camelot was the Kennedy’s attempt to transform an exaggeratedly wide electoral coalition – the Kennedy/Johnson, Yankee/Cowboy coalition – into an effective governing coalition, an attempt which failed at the Bay of Pigs, its first test, as it ultimately failed in Vietnam, its most tragic test. Thus, we simply put what we know about the “irrationality” of Kennedy’s policy together with what we know about the conflict within the “irrational” policy was formed, and we answer Halberstam’s question about how Kennedy “could have so misread the Cuban people” with another question: How could the liberals have so misread Kennedy’s situation? And still misread it a decade and more later? How could they have read the Bay of Pigs invasion as a Camelot project while at the same time claiming to be baffled at the inconsistency of that invasion with Camelot values and consciousness? Yes, Kennedy would have been foolish some other way. The Bay of Pigs seemed Nixon’s way of being foolish. The trick of how the invasion could come about nevertheless, how there could be a Bay of Pigs against the will of the president, is that the president is not an absolute monarch ruling a submissive bureaucracy. Rather, a “corporate” presidency is nested within the federal power grid along with a variety of institutional strongholds, such as the Pentagon, the CIA, the Department of Transportation, the Texas Railroad Commission, etc. The president in proper person is only one among many others on the larger board of national directors – a special stronghold clearly but by no means the only power source on the scene. The presidency of the corporate state is the presidency of factional and bureaucratic coalitions that can weaken, grow old and brittle, fail in crises. The tragedy of Frontier Camelot, whose prince is said to have sought the presidency “because it’s where the action’s at,” unfolds in the princes gradual discovery of the corporate and limited nature of his office, then more particularly of its relative weakness against the will of the clandestine establishments of defense and security. Nixon proceeds to describe the “spirited policy discussions on Cuba” that then took place within the Eisenhower foreign policy establishment and tells how his position hardened around the conviction that Castro was not naïve, while (as he says) “the majority view in the State Department was in sharp disagreement with my appraisal of Castro.” He says the foreign-policy elite harbored the view that Castro was “liberal” (Nixon uses the word with quotes). We do not know that Nixon was the author of this decision, but we do know that Nixon was the chief political officer of the decision-making body, the Special Group of the National Security Council. Further, Johnson writes that “in reconstruct [ing] the process by which the ‘Special Group’ made its decision, one impression comes through very strongly: Dwight D. Eisenhower was not a major participant. Eisenhower himself has said publicly that there was no plan for an invasion while he was in office; that the only plan was to train guerrillas. His contention varies so sharply with the facts that an explanation for the discrepancy must be sought, for Eisenhower’s integrity cannot be questioned. Prouty’s main purpose in this book is to counter Daniel Ellsberg’s thesis that the CIA was largely right about Vietnam and the Department of Defense largely wrong. Prouty says it was the other way around. It was in reality such “hardnosed liberals” as the CIA’s Tracy Barns and Edward Lansdale (for whom Ellsberg worked in Vietnam) and Kennedy’s chief military adviser Maxwell Taylor who advocated clandestine war, or Special Forces warfare, as an alternative to conventional military and diplomatic options and thus got the U.S. involved untenably in Cuba and Vietnam. This is an intriguing and subtle dispute: the spies proving we should trust them and not the soldiers, the soldiers proving the spies lie and it is they who saw the truth. Prouty supports Haynes Johnson’s view that Eisenhower did not support the decision to invade Cuba. He writes, “In fact, all of the Eisenhower-era schemes were extremely modest when it came to action against Cuban soil and property.” In an interview I had with Prouty in Washington in May 1973, he added an interesting detail. What Eisenhower had approved in the way of an anti-Castro action program, said Prouty, was a thirty-three man project looking toward the feasibility of forming a guerilla base in the countryside. But within days of the election of Kennedy, says Prouty, “orders came down” (he does not say from where) to change the 33s on the program’s personnel records into 3300s. One might find it an incredible spectacle were it not before us as a model, so to speak, that Howard Hunt himself, a black propagandist par excellence, sat down with a gluepot, a typewriter, a Xerox copier, a light-table, an X-acto knife, and sameple and related communiqués from the inner-sanctum files of the State Department to prove in 1972 that the Kennedys in 1963 had ordered the assassination of Diem and his brother-in law Nhu as well as the coup that toppled them from power. This make it easier to picture someone like Prouty – big, distinguished, honorable – sneaking around in the office at night with a flashlight carefully typing in two zeros after every 33 in all the records of the anti-Catro guerilla project, records which may for that matter at that moment been few. Thus it was, in any case, according to Prouty, that the myriad approvals of the 33-man job were fobbed off on Kennedy by the pro-invasion group as approvals of a much bigger project, the Bay of Pigs invasion. Another kind of evidence that the Bay of Pigs invasion was engineered by conspiracy was developed by Robert Scheer and Murray Zeitlin in their 1963 book, Cuba: Tragedy in Our Hemisphere. By the method of comparing translations of Castro speeches used in White House papers with translations appearing elsewhere in the world press as well as with official Cuban transcripts, Zeitlin and Scheer established that the CIA translator either was naïve about the Spanish language or intentionally changed Castro’s meaning. Uniformly, the CIA translations being presented to Schlesinger and the Kennedys for analysis made Castro sound harsher and more belligerent than he was, encouraging the picture of a tyrant governing against popular will. This played into a wider concert of Hunt style disinformation being orchestrated from somewhere outside the Oval Office with the purpose of making the Oval Office, the Kennedy brothers, think Castro had an unstable popular base and would be overthrown by Cuban people if the United States would show support. When Kennedy took office, he was confronted with what amounted to a fait accompli. The invasion plans were perfected; he was given to understand that they had been drafted under the direction of his predecessor, a man of awesome military reputation. During the election campaign, he had called for aggressive action to topple Castro. Now he was presented with the opportunity. If he turned back, he would have to pit his untested judgment against, presumably, that of Eisenhower and all the military experts. He was on the spot. Just as we recall our own revolutionary past in order to understand the spirit and the significance of the anti-colonialist uprising in Asia and Africa, we should now reread the life of Simon Bolivar, the great “Liberator” of south America…in order to comprehend the new contagion for liberty and reform now spreading south of our borders…Fidel Castro is part of the legacy of Bolivar, who led his men over the Andes Mountains, vowing “war to the death” against Spanish rule, saying, “Where a goat can pass, so can an army.” Castro is also part of the frustration of that earlier revolution which won its war against Spain but left largely untouched the indigenous feudal order. There is obviously a collision of two worldviews in these disparate impressions of Castro. The cornerstone assumption of the liberalism that underlay Kennedy’s Alianza reformism is that the people rebel when conditions are bad, and that the wise prince therefore sees to the improvement of the people’s condition. The explicit message of the Alianza was that the modern empire’s only way to fight revolution was through reform. This is not to sentimentalize our picture of Kennedy. His reformist strategy was after all a strategy of imperialism. But we have at the same time no need to condemn him for the crimes of his political adversaries. He did not accept the assumption that America could ever take as its enemy a foreign population as a whole. The JFK theory of “special war” presupposed that the native population would mostly support the regime for whose protection the U.S. Special Forces had been deployed, and that the insurgent forces could be isolated from the general population. When experience proved these criteria could not be met, Kennedy’s response was to disengage, Johnson’s to escalate. On April 19, 1961, precisely the second anniversary of Nixon’s meeting with Castro, the Free-Cuba invasion forces hit the beach at the Bay of Pigs – without B-26s and without assassination squads. The outcome seemed to vindicate the argument made by such liberals as Bowles (at the time) and Halberstam (ten years later) to the effect that the invasion attempt would be “counterproductive,” that it would increase Castro’s prestige. Halberstam reports that Undersecretary of State Bowles, a blood Yankee liberal, stumbled onto the invasion plans as they were hatching and hurried to the office of Secretary of State Rusk to protest. His argument was that “the chances of success are not greater than one out of three. This makes it a highly risky operation. If it fails, Castro’s prestige and strength will be greatly enhanced. In some ways, this is what happened. Yet the argument seems cynical. Halberstam and Bowles are not actually anti-Castro; neither one actually wants to see Castro’s “prestige” destroyed. Their argument about counterproductivity seems an easy way to get a desired result – hands off Cuba, in effect – without having to be explicit in the Cuban people’s right to revolution and without having to attack the assumption that the United States has the right to invade country x if only practical standards can be satisfied. But what about the CIA’s job on Mossadegh in 1953, Arbenz in 1954, the invasion of the Dominican Republic in 1965, the subversion of the Allende government in 1973? Equally ruthless acts, but effective, successful. On the Halberstam-Bowles argument, how do we state our objection now? How do we meet the anti-Castroites’ rejoinder that the original invasion plan would have succeeded, and would not have increased Castro’s prestige, if the new president had not interfered with the prearranged plan of operations and introduced enormous changes at the last minute. From the standpoint of practical results alone, we cannot tell why Bowles and Halberstam could not just as easily object, “Then why were the colors not shown? Where were the Marines?” A logical Bay of Pigs invasion, existed in other words; if it existed in the minds of its advocates. In this logical Bay of Pigs invasion, the president of the United States was to have been a friend, not an enemy. Nixon would have made everything different – with Nixon in command the bombers would have flown, the assassins would have struck, the fleed would have steamed again into Havana harbor if necessary. But the bad fortune of the Cuban invasion project was to overlap an executive changeover installing a Yankee reformist, a Yankee who talked tough on communism only to upstage Nixon on his best side and who played at coalition with Johnson mainly to help get control of the Senate out of the South. What came forth as the Fiasco, so-called by all parties, each with its own private irony, was not the product of a unified venture. It was rather the product of palace conflict. One side began by wanting a logical Bay of Pigs and the other side began by wanting no Bay of Pigs at all. The result was the Fiasco. The elements of the growth of the Vietnam war are schematically the same as those of the Bay of Pig: (1) Clandestine beginnings with limited objectives; (2) the small force gets pinned down and a regiment must be sent to extricate it; (3) the regiment gets pinned down, etc. From a domestic political standpoint, the Special War period under Kennedy was the link between the commando-style espionage and political action taken under Eisenhower and the full-dress air, ground, and sea war waged under Johnson. But Special War was supposed to lead away from Strategic War, not toward it, much as the commando politics of the late Eisenhower period was supposed to avert the necessity of engagement in the higher strategic scale of nuclear big-power confrontation. Indeed, each phase of escalation is begun with a definition of aims and limits that looks every bit like a built-in guarantee against the frantic rescue missions that inflame the original problem, but the limit is always defined in terms of a strong initial expectation of positive success. The spy will achieve the objective. The commandos will achieve the objective. The Special Forces will achieve the objective. The infantry will achieve the objective. The air forces will achieve the objective. But at last the objective is lost altogether in what becomes the supervening need to rescue the very rescue capability itself. What was the theory of Kennedy’s Special Forces phase? Its chief theoretician, Walt Whitman Rostow, defined communism as “a disease of transition,” a social breakdown to which a society is peculiarly susceptible as it experiences the process of modernization. Once, across the line, Rostow philosophized, a society again becomes stable, as though industrial life is stable in its natural state, as though there is or has been stability in American or European life. But just at the crossing, there is the temptation to go Red, to break faith with the universals of natural rights and free enterprise of the monopolies and turn the problem of development over to international communism. That is where the Special Forces come in. They are there to hold the future for U.S.-world capitalism across the line of Third World social transition. Protected thus from its own transient delirium, country x can lock into the world system of American technical (i.e. military) development assistance and corporate activity defined as the Free World by those who most prosper in its games. That is the basis of the Alliance for Progress, the Peace Corps, the Special Forces, and the Special War expedition to Vietnam. Kennedy carried the Rostowian assumptions to their own combined conclusion. With an Alliance for Progress reform program depicted as working away at the larger social-economic base of the problem, he positions a Special Forces capability to nip the bud of transitional diseases in the social margin. Nipped, these diseases do not grow into revolutions, revolutions do not seize the small states one by one and carry them off into the camp of the adversary, and the United States continues to dominate a generally happy and prosperous world sphere, meanwhile easing toward détente in Europe, which really counts. Country x will have been protected from transitional diseases by the American exertions and can float up into the modern world system on a bubble of American aid, mainly in the form of military assistance designed, above all, to secure the local ruling group and thus keep that kind of peace, ultimately to conglomerate with all the other country x’s in the happy molecule whose master atom is the multinational corporation. That was the system of Special Forces/Alianza world-making for which Kennedy died: the vision of the Round Table, the CFR, the liberals in the Rockefeller-Morgan-Mellon-Carnegie group. What cost Kennedy his life was his attempt to impose the limits of Camelot Atlanticism on a Frontier-minded defense and security elite. His sense of the Cuban and Vietnamese situations seems to have been much the same. In each case, from a practical political standpoint, his immediate adversary was not Cuban of Vietnamese communism so much as it was the American prowar power elite to which he was so beholden and exposed. Recall that Kennedy could assume the loyalty of none of the clandestine and/or armed services – not the FBI, certainly not the CIA, a thousand times not the Joint Chiefs of Staff. This is why it is so important to see that the Kennedy Administration’s record not in terms of its outward rationality, for it has none, and not as the expression of Kennedy’s will alone, for his will did not prevail, but in terms of the impassioned political in-fighting that in reality constituted its actual life. It is the relations of power in America that speak in Kennedy’s apparent formula: If the Cuban exiles can make the invasion alone, let it be done, but only if. Or again: If the Vietnamese threat can be contained with a Special Forces-level commitment, and without disrupting North Atlantic relations, let it be done, but only if. How strong is the evidence that Kennedy intended a Vietnam pullback? We have a few fragments, a chronology. 1. In the summer of 1961, as an outgrowth of the bitter experience of the Bay of Pigs (says Prouty), the Kennedy circle promulgated two key National Security Agency memos, NSAM 55 and 57. The first, a “red-striped” memo on which Prouty was the JSC briefing officer, directed the chiefs to take the command of the Vietnam operation away from the CIA and commence a policy of disengagement. The second, not yet released, emerges in Prouty’s description as a vast philosophical document of comprehensive scope propounding a doctrine of nonintervention in Third World revolutions and a concept of severe limitation in future clandestine operations. 2. (Ret) General James M. Gavin in 1968: “There has been much speculation about what President Kennedy would or would not have done in Vietnam had he lived. Having discussed military affairs with him often and in detail for 15 years, I know he was totally opposed to the introduction of combat troops in Southeast Asia. His public statements just before his murder support this view. Let us not lay on the dead the blame for our own failures. 4. Kennedy remarked to his aide Kenneth O’Donnell in 1963: “In 1965 I’ll become one of the most unpopular presidents in history. I’ll be damned everywhere as a Communist appeaser. But now I don’t care. If I tried to pull out completely now from Vietnam, we would have another Joe McCarthy red scare on our hands, but I can do it after I’m reelected. So had better make damned sure I’m reelected. 5. Wayne Morse, however, maintained that Kennedy was changing his Vietnam policy at the very hour of Dallas: “There’s a weak defense for John Kennedy,” he told the Boston Globe in mid-1973. “He’d seen the error of his ways. I’m satisfied if he’d lived another year we’d have been out of Vietnam. Ten days before his assassination, I went down to the White House and handed him his education bills, which I was handling on the Senate floor. I’d been making to to five speeches a week against Kennedy on Vietnam….I’d gone into President Kennedy’s office to discuss education bills, but he said, ‘Wayne, I want you to know you’re absolutely right in your criticism of my Vietnam policy. Keep this in mind. I’m in the midst of an intensive study which substantiates your position on Vietnam. 7. September 1963: The Kennedy administration launches a general program for disengagement while trying to make it appear we have won the war without having actually fought it. Taylor and McNamara go to Saigon and come back saying they have seen the light at the end of the tunnel. It is announced that the American mission is beginning to draw to a successful end. It is a foreshadowing of the Senator Aiken Plan of 1967: Announce a victory at a press conference and march home as in triumph. General Paul Harkins, commander of the Military Assistance Command in Saigon, tells the troops: “Victory in the sense it would apply to this kind of war is just months away and the reduction of American advisers can begin any time now.” At that point U.S. “advisers” stood at 16,732. 8. October 2, 1963: McNamara takes to the steps of the White House to tell the press of plans to withdraw one thousand U.S. troops from Vietnam before the year is out. 9. November 1-2: the Diem regime, hopelessly tied to a policy of no negotiations with the Viet Cong, is overthrown, then Diem and his brother Nhu are mysteriously assassinated. General “Big” Minh’s regime, incubated in Bangkok exile for exactly this purpose, takes over shortly and proclaims its intention of negotiating a settlement and a coalition government with the Viet Cong. It is no secret that Kennedy was behind the coup and the coming of Big Minh, although there is a question as to whether he was also behind the assassinations of Diem and Nhu. Kennedy had professed public disfavor with their rule and had declared Diem “out of touch with the people.” He sanctioned the Minh takeover and approved of its pronegotiations policy. But what do we make out of Howard Hunt’s furtive work in the files of the State Department, busy with scissors and paste to create his own little “Pentagon Papers” convicting Kennedy of the murders of Diem and Nhu? Was he helping the truth or plying his disinformation trade? 11. November 22: Dallas. Within days of taking over Johnson issues National Security Agency Memorandum 273, reversing the Kennedy policy of withdrawal and inaugurating the period of build-up leading toward conventional war. 12. Early December: The first of one thousand U.S. troops ordered home begin withdrawal from Vietnam. Johnson’s new orders have not reached the field. 13. March-April 1964: Joint Chiefs draw up and submit to Johnson a list of ninety-four potential targets for bombing in Vietnam. 14. May: The new government in Saigon calls on the United States to bomb the North. Johnson declines to rule it out. 15. June: There is a big war powwow of LBJ and the JCS in Honolulu. Johnson resists pressure for a congressional resolution and decides to step up the war effort. General William Westmoreland takes command of U.S. forces in Vietnam. Ambassador Lodge resigns and is replaced by Taylor. 16. July: South Vietnamese commandos, i.e. CIA/Special Forces units, raid two North Vietnamese islands in the Gulf of Tonkin. 17. August: On intelligence patrol in the Gulf of Tonkin, U.S. destroyers Maddox and Turner Joy report being attacked by North Vietnamese torpedo boats. Circumstances of the attack remain unclear. Doubt remains as to whether the incidents were real or staged. In the posturing at which he was so adept, in his imitations of passion, Johnson terrified all but Morse and Gruening of the Pacific Northwest and got the Senate to give him the Tonkin Gulf resolution, opening the way for major escalation. 18. November: The Viet Cong hit Bien Hoa air base in the South and the Joint Chiefs grow heated in their demand for heavy U.S. retaliation. Johnson wins the 1964 election on a “peace” platform vs. Goldwater’s (and later Nixon’s) air-war line; Johnson’s was the biggest “peace mandate” ever until Nixon’s of ’72. 19. December: Johnson approves a plan for air attacks on North Vietnam, “reprisal air strikes for 30 days, then graduated air warfare against North backed by possible deployment of ground combat troops. 20. February 1965: The Viet Cong attack U.S. military adviser’s compound at Pleiku. In “retaliation” Johnson orders the first air strikes against the North. The air war is on. 21. April 1965: The First March on Washington to Protest the War in Vietnam is held by Students for a Democratic Society; twenty to twenty-five thousand hear SDS and SNCC speakers call for a mass antiwar movement. Double-faulting on the invasions of Cuba and Vietnam was not Kennedy’s only failure in the eyes of chauvinism but that was without doubt the major problem. Cuba and Vietnam bracket Frontier Camelot as the ends of a coffin. But in between, there is much more for the Cowboy conscience to find deplorable in Kennedy’s administration. Making no attempt to be inclusive, and leaving aside the much-observed differences of style and manners between the Kennedy group and the Johnson group. I cite the following examples of making the case that from the Cowboy standpoint Kennedy was as bad as he could be. 1. Kennedy’s 1962 Geneva Accords on Laos made concessions to the Communists and led to the pullout of eight hundred U.S. military advisers. 2. Kennedy intervened through the UN and, with direct U. S. assistance, supported Congolese nationalism against Belgian-backed secessionists. 3. Kennedy cut off foreign and military aid to seven Latin American countries, most sensationally Haiti, on the grounds that repressive strongman government was incompatible with the aims of hemispheric reform. 4. He struggled with Big Steel and Detroit Iron to hold down prices. Faced with an inflation rate of 4 percent, minuscule by the standards of the seventies, Kennedy actually wanted to impose a provisional price freeze and won labor’s agreement to the most limited settlements since World War II on the promise the industry would hold the line on prices. When Big Steel took it all back, Kennedy fought (unsuccessfully) for a court-ordered price rollback. It brings to mind the observation of Indira Gandhi that Kennedy “died because he lost the support of his peers” – i.e., the support of the Yankee financial powers animating the vast reaches of the iron and steel industry. For contrast, when steel raised its prices five dollars a ton in 1967, Johnson merely said that steel executives “knew his feelings” and that price controls “could not be ruled out” in the future. Johnson allowed another steel price raise to pass without comment in 1968. 5. JFK proposed elimination of the oil-depletion allowance in January 1963. This by itself could easily have screwed to the sticking point the courage of the American oil cartel as a whole, and most particularly its mainly Southwestern components, the so-called Independents (distinct from the mainly Yankee “Majors”). The oil depletion allowance was and remains the whole basis of Southwestern oil’s special power and glory. Kennedy had already aroused Texan ire in 1961 by attempting to collect a federal tax on state business transactions, a tax no Texan could remember having ever seen collected. Now came the attack on the depletion allowance. Oil industry spokesmen angrily predicted a 30 percent drop in earnings if Kennedy’s proposed tax reforms won out. 6. JFK encouraged the civil-rights movement openly. He introduced his civil rights bill in June 1963 in concert with Martin Luther King’s giant march on Washington. The temperature of Congress rose ten degrees and the whole Camelot legislative program was blocked by the civil-rights debate. 7. The New Frontiersman attack on Johnson as a personality began in 1961 and intensified toward Dallas, focusing in the Kennedy brothers’ pressure on Johnson’s Bobby Baker softspot. The feud between Johnson and Robert Kennedy was unrivaled. What was at stake was not simply Johnson’s political relationship to Eastern power. When Johnson’s man Connally was dispatched in October 1963 to convince Kennedy that he must come politicking soon in Texas, Connolly’s argument was that the Texas Democratic party was in a growing state of disaffection with the national party under the reign of the Kennedys and that fences had to be mended or Texas might bolt the party in ’64. 8. Robert Kennedy’s Justice Department campaign against Jimmy Hoffa, within a wider Frontier Camelot campaign to bust the larger Teamster-Syndicate connection, threatened to expose and destroy a major and basic sphere of Syndicate activity, the Teamster Pension Fund complex. For the past three days the Intelligence Unit has been receiving information concerning the feelings and proposed actions of the Cuban refugee colony in Miami. 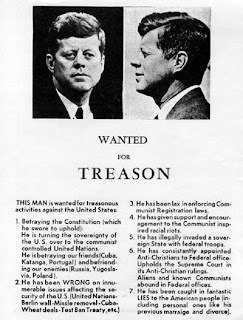 Since President Kennedy made the news release that the United States Government would stop all raiding parties going against Castro’s government, the Cuban people feel that the United States Government has turned against them….All violence hitherto directed toward Castro’s Cuba will now be directed toward various governmental agencies in the United States. 10. In September 1963, even as he was taking the first perceptible steps toward a Vietnam pullback, Kennedy ordered the FBI to raid secret CIA guerilla training camps and staging bases in Florida and Louisiana. Dave Ferrie, linked by New Orleans District Attorney James Garrison to Clay Shaw and the CIA, was infolved in the operation of the Louisiana camps. The camps were situated on land owned by a gambling associate of Jack Ruby’s, Bill McLaney. The McLaney brothers, cogs in the Lansky Syndicate, were among the big losers when the Cuban revolution ejected the Syndicate and its casinos from the island. Frank Sturgis (aka Fiorini) of the Watergate burglary was also connected to the base Kennedy closed at No Name Key. Sturgis was visible at Dallas two months later and was actually questioned by the FBI in connection with the assassination. 11. Constant and passionate struggle to win the hearts and minds of the Joint Chiefs of Staff was a leading existential feature of the actual life of Frontier Camelot. Camelot-Pentagon differences were multitudinous and many-layered, from theories of war to theories of peace, and they were heatedly joined, as indicated for example by Halberstam’s report that on the question of nuclear disarmament, “McNamara virtually locked [the Joint Chiefs] in a room for a week to fight it out with them. 12. But more gut-basic still was Kennedy’s assault on the sanctity of the defense budget. His administration drew up three defense budgets. The 1962 budget was $51.6 billion. In 1963 it went down to $50.8 billion. In 1964 it went down again to $49.9 billion. As of Watergate, after almost a decade of Cowboy rule, it had grown again to about twice that size. Long-time no-conspiracy buff Garry Wills makes and opposite deduction about Kennedy’s politics, which he characterizes as a more genteel but otherwise conventional militarism, by focusing on a different fact” “On the very day he died [that morning in Fort Worth], Kennedy boasted publicly that he had ‘increased our special counter-insurgency forces in Vietnam by 600 percent.’”. Wills seems in no position to add (as late as 1973?) that “counterinsurgency” was Frontier Camelot’s euphemism for cheaper defense and a nonnuclear world strategy. It is not mischievous in serious polemic to decontextualize remarks made in a heightened context? Wills understands that Kennedy’s whole purpose in being in Texas that day to begin with, answering Connally’s imperative summons, was to persuade neo-Confederate elements in the Texas Democratic party that his administration had not been lax in the defense and national security areas in spite of signing on October 7 just past of his limited test-ban treaty, in spite of his closing of the anti-Castro staging bases in Florida and Louisiana, and in spite of his successive annual cuts in the defense budget from $51 to $50 to $49 billion. But was it not clear enough in the contemporary dialogue itself, without “analysis”? Kenendy says, “Yesterday a shaft of light cut into the darkness. Negotiations were concluded in Moscow on a treaty to ban all nuclear tests in the atmosphere, in outer space, and under water.” And the voice of the Joint Chiefs says, “True security lies in unlimited nuclear superiority.” Kennedy says, “There is the necessity for revolution in Latin America.” And the JCS says it is “anxious concerning our future security.” Kennedy says of the South Vietnamese, “We are prepared to continue to assist them, but I don’t think that the war can be won unless the people support the effort.” And the JCS says it is “not sure if it’s necessarily a good thing to cut down on the tensions.” One does not even have to believe that Krushchev was telling us the truth, or that he knew the truth to tell, when he said in his putative memoirs that he got a message from Robert Kennedy at the height of the 1962 Missile Crisis saying, “We are under very severe stress. In fact we are under pressure from our military to use force against Cuba….If the situation continues much longer, the President is not sure that the military will not overthrow him and seize power. The American army could get out of control.” Whether the threat specifically existed or not, the political outlines of that confrontation surely implied it. The mystery which Nixon resigned to protect, and which the Ford pardon sought to “shut and seal,” appears to center on some as-yet-unknown intertwining of Nixon’s and Kennedy’s fates as adversaries in the great misadventure of the Bay of Pigs. To get at what this mystery might be, we find we have to go beyond the conventional Cold War picture of the Bay of Pigs operation. Instead of seeing the invasion simply as a U.S.-vs.-Cuba conflict and the “policy of the Kennedy administration”, we see it as the product of a conflict internal to the policy apparatus pitting a liberal-minded Yankee president against conservative-minded stalwarts of the defense and security bureaucracies. The motive of the Cowboy-Nixon side in this conflict was its desire to push through with Cuban plans laid lovingly in the last days of Eisenhower. (Vice-President Johnson also supported the Bay of Pigs “activists.”) The motive of the Yankee-Kennedy side was its desire to avoid being drawn into a war against Castro’s Cuba. The pro-invasion side was strong enough to frustrate the anti-invasion side but not strong enough to break out, overcome, and be satisfied, just as the anti-invasion side was strong enough only to take the sting out of the invasion, not to stop it. The result, the Cuban Fiasco, set the model for the Vietnam Quagmire, which followed exactly the same logical course, except in giant steps. The period before Kennedy’s assassination is thus a period of accumulating polarizations throughout the universe of the White House policy apparatus. The Massachusetts-Texas electoral coalition that squeaked into the White House in 1960 had by 1963 proved itself nonfunctional and self-destructive as a governing coalition. It is one measure of the power relativities of this coalition’s crisis that the assassination of the president seemed to resolve it. Whatever we decide about the evidence of the assassination, whether we walk away from Warren and the Warren critics believing in a right-wing conspiracy or a Castroite conspiracy or a left-wing lone assassin, we all will still acknowledge on monumental and central fact about the Dallas killing: It got rid of one policy and put another in its place. In the richness of his hypocrisy, Johnson successfully pretended to carry on the torch of domestic Kennedy reform and wholly mystified the question of war and peace in Vietnam by saying sometimes that Kennedy had actually been a hawk like him and other times that he, Johnson, was actually a dove like Kennedy. With Goldwater as an easy rightward foil, Johnson was able to represent his strategy of graduated ground, air, and naval escalation as the peace strategy and thus to campaign on all the arguments usually at the disposal of a peace candidate. Yet as the Ellsberg Papers later showed (and as the poet Brecht long before foretold), even as he beat his breast for peace in the ancient public drumshow, Johnson was secretly signing the marching orders. In this case it was the detailed day-by-day, target-by-target JCS plans for the bombardment of the North that would be launched, as though spontaneously against unexpected provocation (the VC attack on Pleiku), in February 1965, the elections safely past. As for “the whole Bay of Pigs thing,” Johnson was shortly taking care of that, too, in the secret project launched by his Great Society in 1964 called “Second Naval Guerilla.” This project, as reported notably by Szulc, began as a let’s-do-it-right-this-time remake of the Bay of Pigs invasion in which U.S. troops would have been used and in which the assassination of Castro would have been attempted with presidential backing. It was to have been carried out sometime in 1965 after Johnson’s safe reelection, just as with Vietnam escalation. As Szulc observes, “it was an incredibly wild scheme because the resolution of the 1962 Cuban Missile Crisis, which brought the United States and the Soviet Union to the brink of nuclear confrontation, was based in part on Washington’s promise to let Castro be.” The reason the “Second Naval Guerilla” was never carried out is that the early 1965 rebellion in the Dominican Republic made it necessary to land in Santa Domingo the troops that had been made ready for Havana. So Dallas was a turning point in any case, no matter who murdered Kennedy, no matter what the motive. Dallas brought to a close a period of Yankee dominance I the councils of state policy that stretched back essentially unbroken to the Civil War. Johnson easily attached to his own presidential coalition the bulk of Yankee forces willing to accept his reassurance that a military victory in Vietnam would soon be secured and that the advantages of it would be real. But the now splintered and demoralized detentist group found itself suddenly under the heel of precisely the man they had just been spitting on. Old New Frontierists hung on under Johnson, some on the strength of the argument that if they left those who came after would be worse or (as Halberstam suggests) out of a blend of naivete and arrogance that made them think they could find a solution; others because they thought their positions in the policy apparatus gave them power to hold the line of the Kennedy vision in spite of Johnson; others because Johnson seemed an improvement after all. For a long moment, there was even the heady fancy that by one of the ironies of politics, the death of the liberal prince and the ascendancy of the conservative would not make it still more possible to make peace in the world, more possible to bring about lasting changes for social and economic justice because (a) now everyone felt sorry for Kennedy and wanted to pay tribute to him and his social ideas, and because (b) now Johnson would be pulling all his people in, would actually bring the Solid South into the national civil-rights and peace coalition. Was there some uneasiness about that? But surely Johnson could be contained by the Yankees who controlled the bureaucracy around him? Outsiders are left wondering when, of if, the illusions finally wore through (for McNamara, say), or if any of the philosophers of Frontier Camelot ever asked if Kennedy died for Cuba and Vietnam in vain. The illusion of the Cowboy-Yankee coalition proved ultimately the last illusion of Frontier Camelot, possibly because it was at bottom less an illusion than a gamble taken in the absence of alternatives. In any case, the consequences of that failure stretch out over the next decade like the ground path of a tornado. Here we anticipate our story of this failure enough to note briefly the long curve of it ahead: how the installation of Johnson in 1963 was in effect a transfer of presidential power from Yankee to Cowboy national ruling elites; how Yankee powers regrouped and challenged Cowboy rule with the bloodless power play of early 1968 which forced Johnson to abdicate, to start the peace negotiations in Paris, to stop the bombing of the North, and to open the way for the triumphal reform campaign of Robert Kennedy; how Johnson’s overthrow in March was followed by the conspiratorial assassination of King in April, then of Robert Kennedy in June; and how against a backdrop of general world tumult (Paris, Mexico City, Greece, Prague) all forces converged on the complex climax of the Democratic party in Chicago and the eventual triumph of Nixon, which sent the country slanting fiercely toward Watergate. We do not yet know if or how Nixon might have been directly involved in any of this after leaving the office of vice-president, or if he was part of any secret group manipulating Eisenhower through control of information flowing through the National Security Council. But we have developed a more specific sense of the heart of this mystery when we come to see the Cuban invasion as a result of a conflict in which Nixon acted strongly against Camelot policy by way of an invasion group which we know for a fact included Hunt, Sturgis, the Watergate Cubans, yeasty parts of the CIA, Howard Hughes though his man Robert Maheu (to whom we return), and the Lansky Syndicate through John Roselli, whome Maheu reached on behalf of the CIA. What could be the organizational form of the ad hoc clandestine government which such details imply? Finding this, we would find the answer to the mystery of Ford’s pardon and Nixon’s crime. Now our reconstruction comes to the turning point of Dallas. It is time to confront the question that the foregoing analysis of a divided Camelot suggests, namely: If we see that the JFK assassination was a coup d’etat in effect, is there any reason to suppose it was such a thing by design?